Cloud computing is a model that is dynamically, delivered the software applications and hardware infrastructure as the services on the internet to the Cloud users. Clouds provide the services such as virtual servers, storage, application development, design, and testing and these services can access by multiple users at anytime and anywhere. Sometime multiple clients send their requests simultaneously for the same resource therefore, it also faces some problems like scarcity of resources, security, fault tolerance and resource allocation. The optimal resource allocation and resource management is must to avoid these kinds of problems. Numbers of authors have proposed their techniques for resource allocation, from these some are market based resource allocation technique. The proposed algorithm is on the basis of Auction based techniques. Here, number of users can send their request for the different resources with multiple parameters. Seller and buyer has different point of view, customer wants to buy the resource with less price and seller wants to sell their resources with profit so, some techniques are based on the user point of view and some are based on the seller point of view, but the proposed technique beneficial for both because here providers and users send their bids and requirements to the auctioneer. This method dynamically calculates the price, gave the discount to the users on basis of time, and penalise to defaulter provider. It also reduces the SLA violation, VM migration, and Execution time. MLA Reeta and Reena Kaushal. "Multiple Parameter Based Resource Allocation Algorithm in Cloud Computing through Auctioneer." International Journal for Innovative Research in Science & Technology 2.11 (2016) : 1-7. APA Reeta and Reena Kaushal. (2016). Multiple Parameter Based Resource Allocation Algorithm in Cloud Computing through Auctioneer. International Journal for Innovative Research in Science & Technology, 2(11), 1-7. Chicago Reeta and Reena Kaushal. "Multiple Parameter Based Resource Allocation Algorithm in Cloud Computing through Auctioneer." International Journal for Innovative Research in Science & Technology 2, no. 11 (2016) : 1-7. In our daily life, there is an increasing need to create artificial arm where human interaction is difficult or impossible. Its application is used to diffusing bomb by using active volcano. In this we are built robotic arm controlled by natural human arm movement using dc motor. The development is based on ATMEGA-16 with a personal computer for signal processing. The application of this robotic arm is in military operation, manufacturing industries, motels, work places etc. Finally the robotic arm is used for moving object from one place to another. This report deals with a robotic arm whose objective is to imitate the movements of a human arm using DC motor and flex sensor for natural arm movements. So in this paper we are presenting a moderate system. MLA Tejaswini A. futane, Shabina Sheikh, Ratnadina Rodge, Aditi K. Sangai and Jayant Sakurikar. "Robotic Arm Controller by using atmega16 Microcontroller." International Journal for Innovative Research in Science & Technology 2.11 (2016) : 8-11. APA Tejaswini A. futane, Shabina Sheikh, Ratnadina Rodge, Aditi K. Sangai and Jayant Sakurikar. (2016). Robotic Arm Controller by using atmega16 Microcontroller. International Journal for Innovative Research in Science & Technology, 2(11), 8-11. Chicago Tejaswini A. futane, Shabina Sheikh, Ratnadina Rodge, Aditi K. Sangai and Jayant Sakurikar. "Robotic Arm Controller by using atmega16 Microcontroller." International Journal for Innovative Research in Science & Technology 2, no. 11 (2016) : 8-11. E-resources is the emerging trend in the current scenario among students. As the technology grows, the trend is changing then and there. Since this is the period of mobile technology and internet. The study purpose may get more effective by obtaining a recent and practical research. This paper is based on the purpose of using e-resources and the various type of e-resources is more regularly used among the students and the difficulties faced by them while accessing the various types of e-resources. For this study, a structured questionnaire is framed and it is distributed around the sample size of 150 respondents who uses e-resource services and facilities. This paper analyzed about independency between the variables and provides a importance of using e-resources. MLA D. Hema Shanmuga Priya and Mrs.K.R.Mahalaxmi. "A Study on the Purpose of E-Resource: An Emerging Trend among Students." International Journal for Innovative Research in Science & Technology 2.11 (2016) : 12-16. APA D. Hema Shanmuga Priya and Mrs.K.R.Mahalaxmi. (2016). A Study on the Purpose of E-Resource: An Emerging Trend among Students. International Journal for Innovative Research in Science & Technology, 2(11), 12-16. Chicago D. Hema Shanmuga Priya and Mrs.K.R.Mahalaxmi. "A Study on the Purpose of E-Resource: An Emerging Trend among Students." International Journal for Innovative Research in Science & Technology 2, no. 11 (2016) : 12-16. Text to speech system, also known as speech synthesis is the process of generating spoken language by machine on the basis of written input. The purpose of this paper is to introduce the area of speech synthesis by giving an overview of the three main methods of the speech synthesis as concatenative synthesis, articulatory synthesis and formant synthesis. To build a natural s speech synthesis system, it is essential that the text processing component produce a sequence of phonemic units corresponding to the arbitrary input text. This paper discusses Font to Akshara mapping, pronunciation rules for aksharas and text normalization in the context of building text to speech systems in Indian languages. The paper is organized as follows: Section 1 provide an introduction. Section 2 gives different types of speech synthesis Section 3 provides an overview of the text to speech system in Indian languages and Section 5 concludes the manuscript. MLA Archana N A and Vidya M. "Different Approaches of Speech Syntheses and Text to Speech Synthesis Systems in Indian Languages." International Journal for Innovative Research in Science & Technology 2.11 (2016) : 17-22. APA Archana N A and Vidya M. (2016). Different Approaches of Speech Syntheses and Text to Speech Synthesis Systems in Indian Languages. International Journal for Innovative Research in Science & Technology, 2(11), 17-22. Chicago Archana N A and Vidya M. "Different Approaches of Speech Syntheses and Text to Speech Synthesis Systems in Indian Languages." International Journal for Innovative Research in Science & Technology 2, no. 11 (2016) : 17-22. DNA computing is a new computational paradigm by harnessing the potential massive parallelism, high density information of bio-molecules and low power consumption, which brings potential challenges and opportunities to traditional cryptography. In this paper, on the basis of reviewing the principle of DNA computing and the development situation of DNA computing briefly, we analyze some schemes with secret key searching and introduce the application of DNA computing in encryption, steganography and authentication. In the paper we have DNA computing consist computation of DNA strands and its basic molecules like nucleotides. The aim of this manuscript is to illustrate the current state of the art of DNA computing achievements, especially of new approaches or methods contributing to solve either theoretical or application problems. Starting with the NP-problem that Adleman solved by means of wet DNA experiment in 1994, DNA becomes one of appropriate alternatives to overcome the silicon computer limitation. Today, many researchers all over the world concentrate on subjects either to improve available methods used in DNA computing or to suggest a new way to solve engineering or application problems with a DNA computing approach. This paper gives an overview of research achievements in DNA computing and touches on the achievements of improved methods employed in DNA computing as well as in solving application problems. At the middle of the paper we came to know actual mechanism of DNA computing along with DNA structure detail. At the end of discussion, we address several challenges that DNA computing faces in the society and also we focus on the different types of DNA computing applications. MLA Vinayak Suresh Dhole. "DNA Computing and Its Applications in Bio-informatics." International Journal for Innovative Research in Science & Technology 2.11 (2016) : 23-28. APA Vinayak Suresh Dhole. (2016). DNA Computing and Its Applications in Bio-informatics. International Journal for Innovative Research in Science & Technology, 2(11), 23-28. Chicago Vinayak Suresh Dhole. "DNA Computing and Its Applications in Bio-informatics." International Journal for Innovative Research in Science & Technology 2, no. 11 (2016) : 23-28. Moderate and severe earthquakes have struck different places in the world, causing severe damage to reinforced concrete structures. Earthquake often effect the bond between the structural elements and masonry in-fills of the building. Masonry in-fills are often used to fill the void between horizontal and vertical resisting elements of the building frame. An infill wall enhances considerably the strength and rigidity of the structure. It has recognized that frames with in-fills have more strength and rigidity in conditions. Comparison to the bared frames. Hence the studies about the behavior of 3D- frames with or without masonry in-fills are necessary. In this project, the performance of 3D- frames with diagonally in-filled masonry is quantified under dynamic loading conditions. MLA V. Kesavarathnam and Dr. G. Nandini Devi. "Aseismic Performance of 3D RC Frame using ETABS." 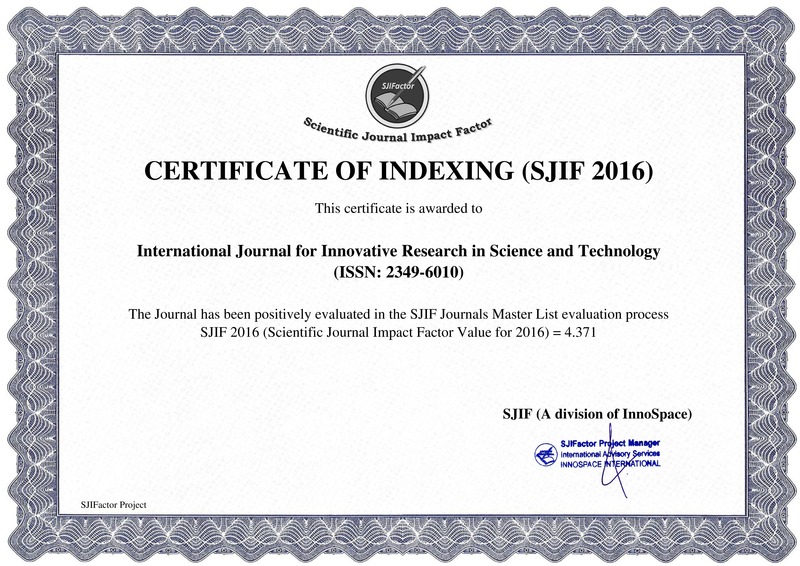 International Journal for Innovative Research in Science & Technology 2.11 (2016) : 29-41. APA V. Kesavarathnam and Dr. G. Nandini Devi. (2016). Aseismic Performance of 3D RC Frame using ETABS. International Journal for Innovative Research in Science & Technology, 2(11), 29-41. Chicago V. Kesavarathnam and Dr. G. Nandini Devi. "Aseismic Performance of 3D RC Frame using ETABS." International Journal for Innovative Research in Science & Technology 2, no. 11 (2016) : 29-41. Recent developments in Electronics communications and information technology doctors will facilitate patient care more and more. Telemedicine systems are used for patient monitoring as well as diagnosis of diseases of remote area patients. The proposed system objective is to develop a low-cost telemedicine system which allows a reliable remote diagnosis health application such as emergency incidents, mass population screening and medical education purposes. The performance of proposed system is Video consultation (VC) which can improve access to specialist care especially for individuals who live in rural areas that are long distance from specialist clinics. The main objective of the present proposed work is to develop a video conference system to have direct interaction of rural area patients with expert to take health care and suggestions. MLA R Harini, B. Rama murthy and P.Thimmaiah. "Telemedicine System for Medical Data Communication in Primary healthcare ." International Journal for Innovative Research in Science & Technology 2.11 (2016) : 42-47. APA R Harini, B. Rama murthy and P.Thimmaiah. (2016). Telemedicine System for Medical Data Communication in Primary healthcare . International Journal for Innovative Research in Science & Technology, 2(11), 42-47. Chicago R Harini, B. Rama murthy and P.Thimmaiah. "Telemedicine System for Medical Data Communication in Primary healthcare ." International Journal for Innovative Research in Science & Technology 2, no. 11 (2016) : 42-47. The proposed project is a high-speed, multi-threading website download and viewing program. The program can quickly extract website and/or some web pages of a site including HTML, graphics, Java Applets, sound and other user definable files, and saves all the downloaded or extracted data in the hard drive. After downloading, all links within the web pages are recreated. It creates a complete hard drive copy of the site that you can view at your own place without being connected to the Internet. Web Grabber duplicate the original directory format of a site so that it easy to download and easy to move from a site to another server. In the event a person loses his Internet connection while downloading a site, the Resume Session allows us to pick up a session. If we wish to update a previously downloaded site, the Update Session feature allows us to revisit a site using new search parameters to make sure we have the most current files. MLA Patel Gopal B., Divyesh Ahir, Suresh Nadar and Shilpa Nimbre. "Web Grabber." International Journal for Innovative Research in Science & Technology 2.11 (2016) : 48-53. APA Patel Gopal B., Divyesh Ahir, Suresh Nadar and Shilpa Nimbre. (2016). Web Grabber. International Journal for Innovative Research in Science & Technology, 2(11), 48-53. Chicago Patel Gopal B., Divyesh Ahir, Suresh Nadar and Shilpa Nimbre. "Web Grabber." International Journal for Innovative Research in Science & Technology 2, no. 11 (2016) : 48-53. Human Resources are cognizance, skills, creative abilities, attitude and other attributes obtained from the population on organizations point of view, they represent the total of the inbuilt abilities, acquired knowledge and skills as exemplified in the talents and attitude of the employees. The policies, strategies and practice lead the company to react on its objectives. It should be a cultural reflection of the values and beliefs of the organization. The policies should be very brief and clear so that everyone in the organization can understand its objective, the steps to achieving the mission. This all is possible if the human resource department of the organization is working effectively. This paper provides clear information about the employee perception towards the HR policies framed by the Organization. This is a conceptual framework based on the previous research papers, journals and various other secondary sources. MLA Divya K and Dr. V.M. Anitha Rajathi. "Human Resource: Employeeâ€™s Perception Towards HR Policies in Information Technology (IT) Companies." International Journal for Innovative Research in Science & Technology 2.11 (2016) : 54-56. APA Divya K and Dr. V.M. Anitha Rajathi. (2016). Human Resource: Employeeâ€™s Perception Towards HR Policies in Information Technology (IT) Companies. International Journal for Innovative Research in Science & Technology, 2(11), 54-56. Chicago Divya K and Dr. V.M. Anitha Rajathi. "Human Resource: Employeeâ€™s Perception Towards HR Policies in Information Technology (IT) Companies." International Journal for Innovative Research in Science & Technology 2, no. 11 (2016) : 54-56. The objective of this thesis titled â€œ24*7 Car Showroom Management Systemâ€, is to provides solution for showrooms for organizing data using web applications. This web application helps administrator to update data in step-by-step process while selling car to customer. Using this system management team can update customerâ€™s information, car information, payment details, insurance details, servicing details, take orders, etc. The website is designed with the help of C#.net coding. We are using ORACLE XML DB Protocol Server for updating, deleting, storing, query, accessing data. It also provides native SQL supported by encompassing SQL data models. FTP (File Transfer Protocol) is used to transfer files from one host to another host. The internet FTP has been incorporated into productivity application such as web page also uses Join algorithm for merging the data. In this, CSS is used for the styling of the web application and Java script is used for linking with the images and banner. All the coding is developed in Photoshop (Version cs3) software. Desktop application that is Database uses Single stored procedure instead of creating separate procedures for each operation. These procedures are to be accessed in the code, depending upon the action performed by end user on a button click. Primary key is set on the idâ€™s and another keys according to the need. The project is a car showroom management system which is developed using C#.net 2010 as front end and SQL Server 2008 R2 management as back end. Textbox label is used for login and created classes for adding information. MLA Srushti Puranik, Neha Selokar, Nidhi Bhoyar, Roshani Pimpalkar and Vijay Masne. "24*7 Wagon Management for Car Showroom." International Journal for Innovative Research in Science & Technology 2.11 (2016) : 57-61. APA Srushti Puranik, Neha Selokar, Nidhi Bhoyar, Roshani Pimpalkar and Vijay Masne. (2016). 24*7 Wagon Management for Car Showroom. International Journal for Innovative Research in Science & Technology, 2(11), 57-61. Chicago Srushti Puranik, Neha Selokar, Nidhi Bhoyar, Roshani Pimpalkar and Vijay Masne. "24*7 Wagon Management for Car Showroom." International Journal for Innovative Research in Science & Technology 2, no. 11 (2016) : 57-61.